Harry Harbord 'The Breaker' Morant commanded the unit of the Bushveldt Carbineers. His best friend, Captain Percy Hunt, had been killed in an ill-conceived attack and 'The Breaker' vowed revenge. What was to follow was a series of callous murders and trumped up accusations - leading to arrests, Court Martial, and executions - the result of which still reverberates today. In an effort to round up all Boer men, women and children who were still trying to 'ride out' the war in the rugged bushveld they knew as home, Morant and certain fellow officers, fully believing in Kitchener's orders that no prisoners were to be taken, became a feared and brutal force - testament to the fact that even the most ordinary of men can become monsters in the arena of fighting a 'gentlemen's war'. This story, despite having occurred some 100 years ago, is alive and well and has certain proponents in Australia launching appeals to the British government to have Lieutenants Morant and co-accused Peter Handcock pardoned for murder - the most recent appeal having been in 2011. 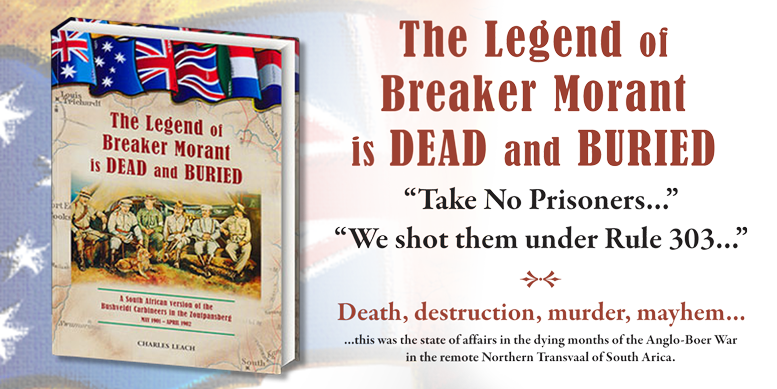 This book presents a South African version of the story and reveals no less than 35 known murders committed by these men, aided and abetted by the notorious Captain Alfred 'Bulala' Taylor of British Army Intelligence. How many murders does one have to commit in order to be found guilty? Charles Leach, born at the Swiss Mission Elim Hospital, descendant of Cooksley-Kleinenberg-Zeederburg families, has spent the last 7 years researching the events which occurred in the last phase of the Anglo-Boer War on his 'home turf'. Well known local historian and tour guide, there is none better to tell the story of how events transpired in those last years. Charles Leach's impressive research has revealed that the crimes of Morand and his associates were worse than originally thought. In today's day and age Morant and Handcock plus several others would be arraigned before a War Crime Tribunal. Joe West - Renowned British Bushveldt Carbineers Researcher.